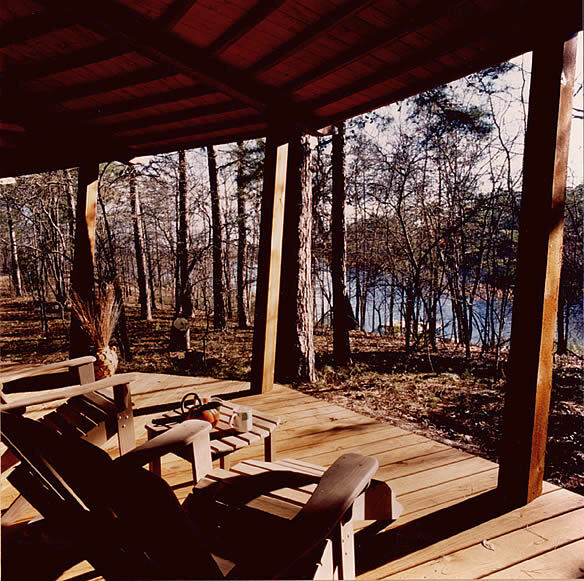 Lyrically named the Lily Pad Cabin, this small gateway in the piney woods of east Texas is intended to remind the owners of their days spent camping on the site before commissioning their permanent shelter. 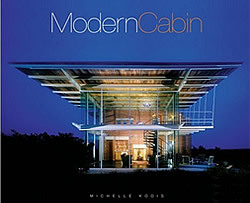 "The clients wanted a comfortable yet unpretentious vacation home with a very intimate interaction with the outdoors, similar to what they had experienced sleeping in a tent," says Matthew Ackerman, the architect hired to design the cabin, which sits on two acres of land on the shores of Lake Horse Shoe Bend. The cabin is just 1,050 square feet in size but its open floor plan and the absence of full interior walls makes it appear more spacious. The clients were specific about what they wanted in their retreat: a round house with 360-degree views, lots of interior windows hardwood floors; a wrap-around deck to "blur the boundary between inside and out"; and a wood burning fireplace. And there was another requirement: it had to be as inexpensive as possible. Ackerman accentuated the cabin's rusticity by leaving the roof framing members exposed to the interior and by using Western red cedar throughout the building. The round shape was achieved with a twelve-faceted wall system that created the opportunity for extensive glazing to maximize the forest views. The undulating roof– the inspiration for the Lily Pad moniker– relied on an innovative framing technique that resulted in an up and down motion to the perimeter bearing walls, which in turn brought "an organic rippling effect to the exterior roofline that echoes the lily pads found along the edges of the lake." the architect points out.